A model of Chicago’s Picasso stands in Gary, Indiana, in a career center. It’s made of wood, and served as a reference for the American Bridge Company, a division of U.S. Steel, as they built the big one. The wooden model was donated by the American Bridge Company in 1970 to the to Gary Public Schools. Today some people there want to sell it to raise money for the schools. How much would you get, a few hundred thousand? What’s wrong with a little sculpture? Couldn’t the town use some wonder? It has to stay in Gary. I think they should just display it more prominently, where more people can see it. It’s a part of their past they should be proud of, this connection to the great Chicago Picasso, and all their steelworkers could do. 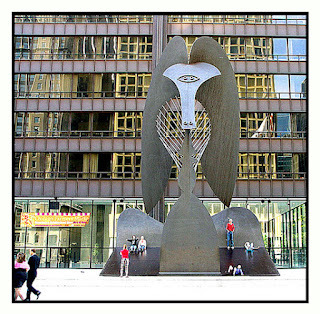 The Chicago Picasso, as it is generally referred to, was unveiled in the Civic Center Plaza on August 15, 1967. Executed from Picasso’s 42-inch steel model, the finished sculpture is 50 feet high and weighs 162 tons. The material for the sculpture is of the same type of steel as was utilized for the exterior of the Civic Center building and this steel, after sufficient exposure, will gradually achieve a similar patina. Fabricated by the United States Steel Corporation under the supervision of the Civic Center architects and engineers, the sculpture was completely pre-assembled in Gary, Indiana, disassembled, shipped to the Civic Center, and reassembled in its final form. The model should stay in Gary like the Eakins painting “The Gross Clinic” should stay in Philadelphia. If it matters, and I suppose it does, Picasso was influenced by African art. Chicago Public Radio ran a story on this, which I edited. It’ll be posted online soon. 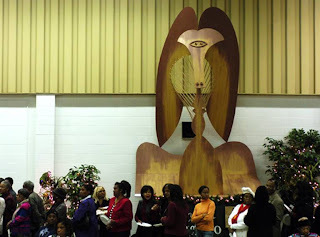 This entry was posted on 12/22/2006 at 3:30 pm and is filed under 16533895, Gary, Indiana, Picasso, sculpture. You can follow any responses to this entry through the RSS 2.0 feed. You can leave a response, or trackback from your own site.